To successfully stand against the enemy, we must take up all the armor God has provided. If our armor is incomplete in any area, we will be ineffective both offensively and defensively. God wants His church properly arrayed in His armor so that we may effectively stand, not wrestle with, but stand against Satan and his demons. The battle has been fought and the enemy has been conquered. This glorious victory has been handed over to you and I. We have been made more than conquerors and have gained a surpassing victory through the death and resurrection of the Lord Jesus Christ. As we resist the devil the way God intended for us to, he will flee from us in defeat. 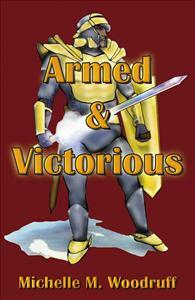 Remember, as soldiers in God’s army we are both ARMED AND VICTORIOUS! It was an exilent book for learning who we are in christ it really helped me understand the importance of being armed and ready to walk in gods victory everyday. I recomend this book to all the readers out there. Very interesting perspective of Paul as a prisoner in Rome, comparing the effective Roman soldier's armor and weaponry to the spiritual armor of God (Ephesians 6). The author gives great detail as she reveals the history of each piece. Building faith and stirring great confidence that victory is certain for the Christian who will indeed learn to effectively put on the armor of God to live 'Armed & Victorious. This book thoroughly examines the armor of God, illustrating its importance to the Christian in their daily life. The format is such that it is an excellent tool for both individual or group study. I recommend it as an addition to every Christian library.